Felix from Gurney's Seed and Nursery prunes a three year old Asian Drippin' Honey pear tree, demonstrating how and where to make the cuts in order to create optimum balance so the branches can support the high fruit yields that the tree is known for. Hi everyone, Felix here at Gurney's. 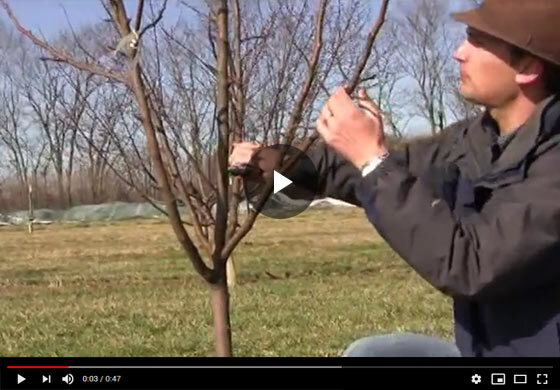 Today we're talking about pear pruning, I'm looking at an Asian pear here and in a preceding video, the year prior, we addressed to cut down here at the base. We had a primary leader that didn't really develop that well for us, but it was a bulk of the tree. We had a nice straight shoot coming up from it so we made that cut last year and this straight shoot now developed into a really nice framework, which is what we want with a pear. We got a nice scaffold branch in the branches coming off the primary shoot, which is where we can support a lot of fruit yield and that continues to grow upward and we're going to do a little pruning on this today to further develop where the limbs where we want them, we have one issue here where we have a lower scaffold, what we want it, it has a lot of fruit buds on it. This upper scaffold here is growing in the same direction so it's going to shade that lower branch - really we want one coming off here in between those two lower branches. So you don't have that branch on top of branch development so we're going to cut this one off because it's not going where we want it. So a nice flush cut there and get that one off the tree. Here we have a limb, that's growing to the interior, we talked about that before. Trim those up and this branch here is going to develop into that upper scaffold and it's going right where we wanted it between these two lowers, and so it's not on top of another branch shading it and on the other side here we have another problem where it's growing on top of this lower branch. And here you know, we know what we have in the middle - is two primary leaders, they're both growing vertically. We really only want one of those so I'm going to take that out and then the last cut here is going to be to stimulate some more branching right in this range right here, and the rule of thumb is after you make a heading back cut on your primary leader, which is just to cut this tops the branch essentially you're, going to stimulate these buds here about four inches below that heading back cut to break, in other words, to initiate shoot growth, and so we've taken that primary central leader, topped it back and we're going to get shoot initiation here for more scaffold development, in addition to this one, we already have where we want it. That's all the pruning we're going to do on this tree and next you will come out here and shoot a video, will show you what happened on this in the flesh with this tree so you can have some confidence about making those kinds of cuts, and you can see the outcome of what happens when you cut back a central leader like that for shoot development. Pear tree here, this is a Asian Drippin' Honey , how to take care of it, about the third year, what your tree would look like in the third year after planting. Thanks for joining us.